Full disclosure, I was provided with an advance copy of this book by the author as part of his “A-Team” in exchange for an honest review. The worst case of the Mondays ever! 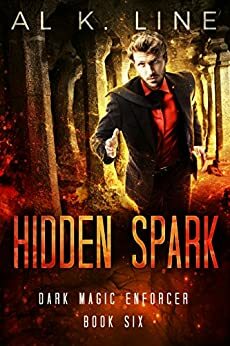 Hidden Spark picks up five years after the conclusion of Neon Spark. Having successfully tracked down and eliminated Kimiko Kochi after impossible odds Faz has entered retirement from the magical community. Being totally magic free for the past 5 years, he is a new man… and totally miserable. A deep depression grips him complete with night terrors and general feelings of worthlessness. But he is resolute… the addict is reformed and he will no longer partake of the stolen magic he so desperately craves. When the phone rings one early morning, not unlike many other occasions, Faz knows what he must do. But of course an Enforcer’s job is not easy, especially when it involves dragons, dwarves, gnomes and fanatics running amok in the streets of Cardiff. Luckily, Faz has Kate and a sidekick this time to help him out but the situation spirals quickly out of control until it turns into an all-out war for survival. It will take more than the Black Spark to set things right this time. I was wondering where the Dark Magic Enforcer series could go after the ultimate resolution of Faz getting the revenge he’s waited a century to deliver. I seriously thought that the series would be over after Neon Spark but I must say that I am glad that it wasn’t. The 5-year gap between Neon Spark and Hidden Spark, in my opinion, was perfect to set the stage for a new era in the Cardiff Hidden community. The councils have settled down and installed a new head with the wizards and vamps actually playing nice for a change as the community as a whole appears to have healed and rebuilt after the prior troubles that plagued them. During this time, Faz has been playing farmer with the chickens and setting out porridge for the hobs. As he resumes his enforcer duties after being so purposefully checked out for so long it’s like he’s coming out of a daze and opening his eyes to all that he’s missed. The unlikely situation of Faz taking a younger wizard under his wing and letting him tag along for some on the job enforcer training is interesting too with Spark being an alone, the dynamic of having a sidekick is pretty amusing to watch develop. As usual there is no end to the fast paced incredible amounts of action and situations that keep our favorite Enforcer on his toes. From the dwarven kingdom to the bowels of a volcano, our hero really has his work cut out for him this time. And with an ending that had me screaming at my kindle… I am very ready for Dark Magic Enforcer 7!